Indeed, Zavador is becoming a good place for mining and digging. The Gnomes of Zavandor is only the fourth entry in Lookout Games’ Zavandor series – a series of games that share the name, but very little of mechanics and settings and were all created by different designers – but it’s the second to make you swing the pickaxe. The first two games, The Sceptre of Zavandor and The Dragontamers of Zavandor (which has not been officially translated to English) dealt with things aboveground, but The Mines of Zavandor started the trend of digging up shiny rocks last year, focusing on Zavandor’s dwarf population. This year, our voyage to Zavandor takes us into the lives of even shorter people: the gnomes. Continuing the trend, I see The Halflings of Zavandor in 2013. It will most likely deal with picking mushrooms. 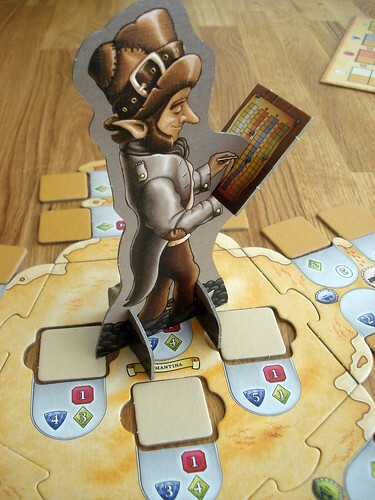 The Gnomes of Zavandor shares the four different colours of gems with The Mines of Zavandor, but the similarities don’t run much deeper than that. Gnomes is a game about economy: the four kinds of gems each have their own changing market value, and almost everything you do adjusts the price up or down. This gem exchange is at the centre of the game, and it’s important to know one thing about it: the price doesn’t change immediately. Whenever you adjust the prices, you adjust the future price marker and the real price only changes at the end of the round. But what is it that you do, anyway? You arrive in the little mining town of Diamantina with little more than the shirt on your back and a small bag of gold coins. But this is the land of possibilities, and you set out to be Diamantina’s richest gem trader – just like everyone else here. Of course, we all know that the best way to achieve prosperity would be to open a bar here for all the thirsty gnomish miners, but that would be the halfling thing to do and is not included in this game. Real Gnomes get rich by digging and playing the stock exchange. 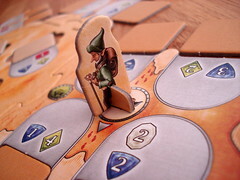 Gnomes plays in rounds of – initially – three actions per player, taken in turns. Of course, everything in Diamantina revolves around gems, and so do your action. You may buy or sell gems at the exchange or you trade your hard-earned gems against various other things. The most common thing to buy for gems is mining concessions: the rights to dig into a claim around Diamantina go for pretty much any combination of two colours of gems. What you get for the price is different every game, but if you don’t want to be surprised you can take soil samples and look at a claim before you buy it. Each round only one of the five mining areas is available, and the surveyor gnome selling the claim moves on after he made a sale in one area so when you’re saving up to pay for a claim, keep an eye on where the little guy might be at that point. The claims inside the city walls are more desirable as they can produce gems of any colour, but they also go for a much higher price. You may also make contact with one of the gem traders – who just happen to look a bit seedy, but we’re sure they are perfectly trustworthy – and make use of him later to exchange one colour of gem into another. If you’re not interested in hard manual labour or dealing with Diamantina’s shady side, you can also invest your gems in fine jewellery which are worth the highest amount of victory points but don’t have any other use. Finally, you can do what gnomes are most famous for and go high tech: the different kinds of artefacts are not cheap and not valuable in victory points, but when used right they are very powerful. The Gnomunculus gives its owner an additional action per rounds, the Alchematic produces gold from nothing, the Emeromobil (a.k.a. shopping cart) gives you a discount when buying gems and the especially unpleasant Hoovermatic takes money from other players when they mine their claims. The artefacts have silly names and quirky illustrations, but they are nevertheless powerful and when owning them you should adjust your strategy accordingly. After everyone took their actions, it’s finally time to do what we all came to Diamantina for: mining. For the first mining concession you own in each colour, you mine one gem, for every other concession in the same colour you mine two of them. After a few turns, this can turn into a veritable torrent of gems, but don’t expect it too make you rich in a hurry, mining gems lowers the price for that colour. Development of gem prices is something to keep an eye on in general: buying and selling at the exchange only lowers and increases the price by one gold coin, no matter how many gems you sell or buy. Trading gems for mining concessions, jewellery or artefacts, on the other hand, raises the price by the number of gems paid. Mining gems lowers the price by the number of gems mined – and that’s why mining won’t make you rich in a hurry: the more you mine, the lower the price will be. The gem price economy is at the heart Gnomes of Zavandor and you’d do well to understand it. The price development doesn’t exactly match what we expect from real economy. Some things are as you’d expect them to be: buy gems at the exchange, the price rises because of the increased demand. Sell gems, the prices drop. Mine gems, the increased supply lets the prices drop. The mysterious part is why the prices jump up every time you use gems to buy something and some more deviation from real economy comes in because all prices are capped at 15 coins. 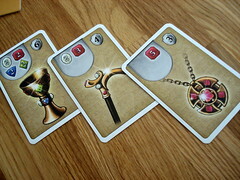 Regardless, the price development is predictable and predicting it is a key skill to win in Gnomes of Zavandor. As a general guideline, expect the prices to fluctuate a little in the beginning, then hit the ceiling after a few rounds as people start shopping and finally slowly go down again as more and more gems are mined. There is one ugly corner in Zavandor’s economy: the readjustment of the market after the first round. You see, after the first round each player receives as much money as the highest gem price is at that point. That price is then lowered, depending on the amount of gems of that colour currently in the game. It’s not terribly in itself, but it does make the first round follow a completely different pattern as every other round because you cannot rely on the prices for the next round. Some other extended setup might have made the start of the game easier and faster. Gnomes of Zavandor is not a game you start with a strategy in mind and execute it until the end. Too much depends on the gem prices, which claims you can afford and which artefacts you can grab. But while there are big differences in the details of how you play – which artefacts you buy, when you buy or sell gems – the big outline generally stays the same. To win the game, you need to buy and sell some gems first, then grab some mining concessions and one or two artefacts and finally acquire a bit of jewellery to win the game. That’s the steps you will always follow, there doesn’t seem to be a way to win by just playing the stock exchange, for example, you will always have to do a bit of everything. Unfortunately, Gnomes of Zavandor doesn’t have much space for art . The illustrations that are there are great, I especially love the box cover and the start player gnome – although I don’t get why the start player gnome has the size of the statue of liberty, he might be the single biggest game component we have here that is not a game board. Seriously, guys? Giant Gnomes? Anyway, the game board and the gem price board didn’t leave any space for illustrations and feel rather cold and mechanical. But that’s a complaint I’ve been trying to put in words about the whole game: it does feel mechanical at times, you spend a lot of time thinking about game mechanics and don’t really notice that there is a theme to it. The artefacts are the big exception to this, they yell “A gnome built me!” at the top of their lungs – especially to me as a World of Warcraft player – and I wish there was some more of that flavour in the rest of the game. In the end, Gnomes of Zavandor is a trading game that sits in the middle ground that is “very light for someone into economic games” and “quite economic for someone into light games”. Although the atmosphere is a bit thin and your decisions are more tactical and strategic, Gnomes of Zavandor is fun to play and is a good test for you to find out if the heavier kind of econimc game like Indonesia or the 18xx series is for you. A little curiosity to end with: Diamantina is also a city in the Brazilian state of Minas Gerais that was founded for the same reason as the Zavandorian city of the same name: Diamonds. 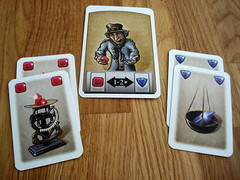 This review is based on the German edition by Lookout Games. If our translation of gnomish artefacts doesn’t match up with the official translation, don’t blame us.